MTS/M2TS is a file name extension used for the Blu-ray Disc Audio-Video (BDAV) MPEG-2 Transport Stream (M2TS) container file format. This container format is commonly used for HD video on Blu-ray Disc and AVCHD. MTS is developed by Sony and Panasonic together as the recording format for the HD camcorders, commonly the 4K video recorded by the trending Sony, Canon, Panasonic 4K cameras or camcorders is in MTS format. It s a wonderful idea to watch your impressive mts footages on Samsung TV. However, MTS files can’t be accepted by Samsung TV by default. So how can you make .mts files playable on Samsung TV? When you want to play MTS/M2TS on Samsung TV, you need to convert .MTS files to some file that’s readable on a media player on Samsung Smart TV. There are a huge amount of tools out there that allow you to convert MTS files to Samsung TV friendly formats. While in view of converting speed and quality, here I highly recommend you try Pavtube Video Converter Ultimate, which can fast help you convert MTS to Samsung TV accepted MP4 videos without any quality loss. Besides MTS, the program can also convert M2TS, AVCHD, MKV, AVI, VOB, MPEG, MPG, MXF, H.265, WMV, MP4, etc. video formats to play on Samsung TV smoothly. This easy-to-control mobile phone video converter is aimed at making various video formats perfectly played on your Samsung TV with the optimized presets provided. This software can also convert 3D MTS video files to 3D format or 2D format, it can also convert 2D to 3D! If you’re a Mac user, simply turn to the Mac version here. Launch the MTS to Samsung TV converter. 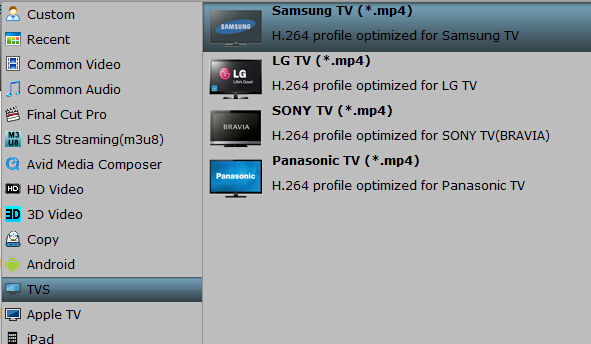 Click “Add video” button to import the .mts files copied on your hard drive which you like to play on Samsung TV. You can also use the drag-and-drop method to load the .mts files to the application UI. Tip: If you want to merge multiple MTS files into one for easy editing, please tick the box “Merge into one file” to merge all the imported clips. Click the “Format” drop-down button to select Samsung TV compatible “Samsung TV (*.mp4)” from the “TVS” category. Or follow the path “3D Video > MKV Side-by-Side 3D Video (*.mkv)” if you need to play 2D/3D MTS footage on Samsung 3D TV. Before start the video conversion for Samsung TV, you can click the Settings icon and adjust the video bitrate, codec, frame rate, audio sample rate, etc parameters. If you original videos are in 4K resolution, you can keep the video size as original for Samsung 4K Ultra HD TV. Or set the video size as 1920*1080p to compress 4K MTS files for better playback on Samsung TV. Click the “Start conversion” button to start converting MTS to Samsung TV more supported MP4 video. 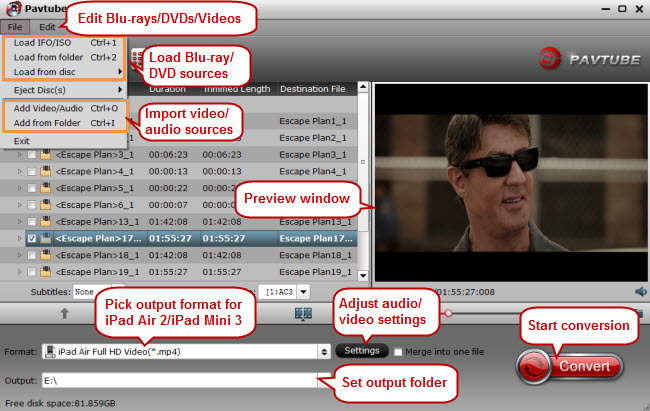 When the conversion is finished, you can click “Open” button to get the generated MP4 files effortlessly. Just transfer and play MTS clips on Samsung SUHD TV, Samsung Smart TV, OLED TV, UHD TV, 3D TV, LED TV, etc. from a USB, memory card or a streaming Device like Roku, Chromecast, PS4 Pro, Xbox One S.
Note: Pavtube Video Converter Ultimate is also an excellent Blu-ray Ripper + DVD Ripper that can rip Blu-ray and DVD to Samsung TV, LG TV, Sony TV, Panasonic TV, etc. If you have some video playback issue on TVs, just try this video converter to re-encode your videos. Next → Next post: How to Play Blu-ray ISO on Samsung TV?